Featuring a move to color, 1941 Play Ball Baseball continues the brief but strong vintage releases from Gum, Inc. 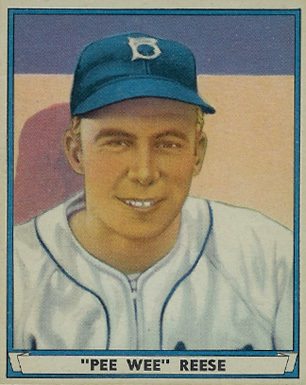 In addition to valuable cards for Ted Williams and Joe DiMaggio, 1941 Play Ball is home to the only official Pee Wee Reese rookie card. 1941 Play Ball Baseball was the line's third and final installment before World War II, which halted the production of cards and severely curtailed gum production. When the war ended, Gum, Inc. resurfaced as the Bowman Gum Company and began its card production anew. That makes it one of few pre-war card makers to release cards after the war as well. 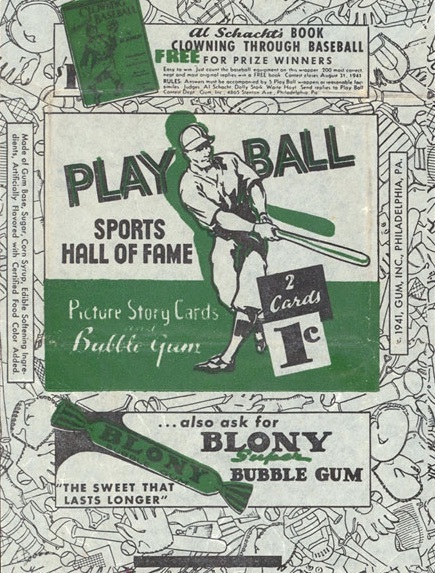 With a total of 72 cards, 1941 Play Ball Baseball is the smallest of the three sets from Gum, Inc. However, the overall aesthetic appeal is improved by having the cards printed in color. This makes it more widely collected than either the 1939 or 1940 sets. 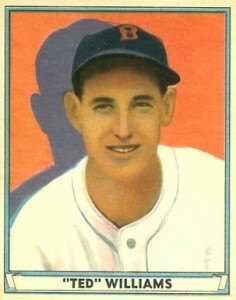 In essence, 1941 Play Ball Baseball cards are a colorized version of their 1940 counterparts. 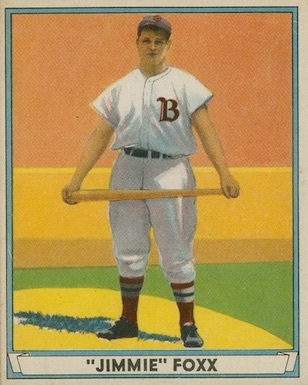 Another notable difference is that the ornate banner with baseball gear has been replaced with a more subdued example containing the player's name and often a nickname. The 2-1/2" by 3-1/8" cards are officially recognized as R336. 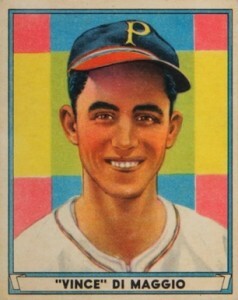 Simply incorporating color into the card's design wasn't the only thing that make the 1941 Play Ball Baseball cards stand out. Backgrounds are vivid and sometimes multi-colored, with added shadows and perspective. The design appears to be a combination of the Art Deco design that made 1934-36 Diamond Stars stand out and the comic art of 1938 Goudey so timeless. The 1941 Play Ball Baseball card backs are similar to the other Play Ball sets, with a lengthy biography. 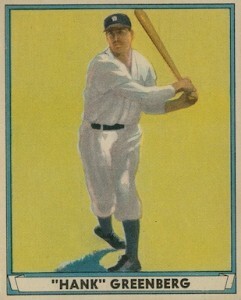 A caption at the bottom seems to indicate the cards may have been intended as part of a larger "Sports Hall of Fame" set, but no other cards ever surfaced. Any cards that are missing that caption simply contain an ad for Blony gum. 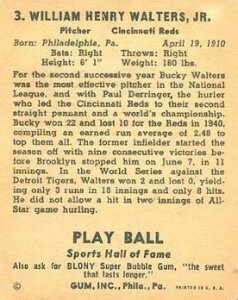 There are some 1941 Play Ball cards that are printed on paper rather than cardboard. It has been speculated that these cards were part of a promotion. 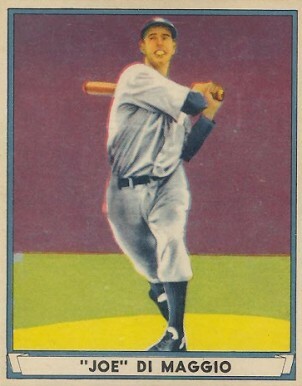 1941 Play Ball Baseball features a number of stars and Hall of Fame players, with the big three being Joe DiMaggio, Ted Williams and Hank Greenberg. 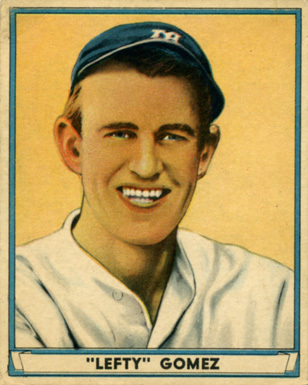 Other players of note include Bill Dickey, Lefty Gomez, Carl Hubbell, Chuck Klein and Mel Ott. 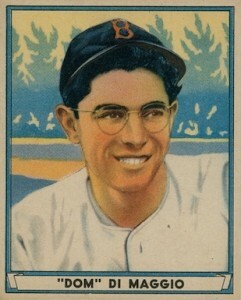 The set also features the rookie-year card of Pee Wee Reese. In addition, the second series cards (#49-72) are only slightly more difficult to locate than those of the first series. Another difference between the two series is that while series one is found with and without the the 1941 copyright date, the second series does not include any date. Of the three Play Ball sets, this is perhaps the easiest to complete because of its small number of total cards. 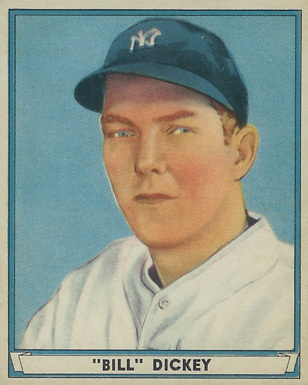 One interesting factoid about 1941 Play Ball Baseball set is that it is the only major baseball card issue to feature all three of the DiMaggio brothers (Joe, Dom and Vince). 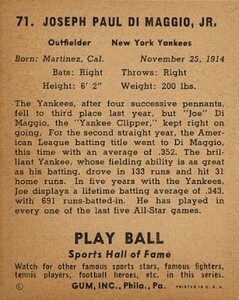 While Joe is clearly the most famous of the DiMaggios, all three brothers played in the majors during 1941. 1941 Play Ball #42 Wally Moses Athletics SGC 40 !! 72 cards. Shop for base cards on eBay. Very handsome cards indeed. These are excellent examples of the Art Deco style, as the write-up stated, with a bit of minimalism thrown in for good measure. Having all three Di Maggio brothers in the set, is just the perfect icing on the cake.